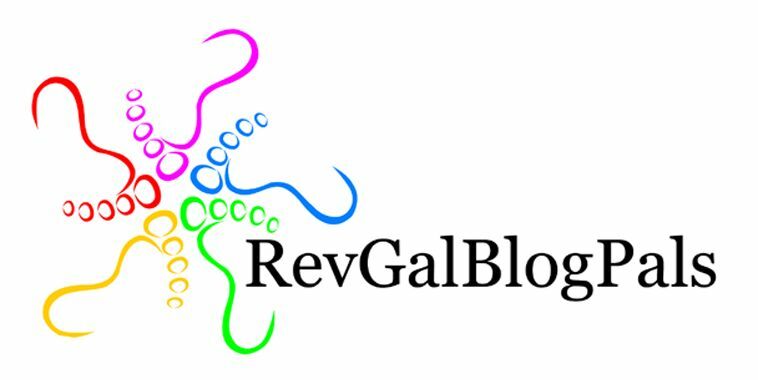 This post was originally published at Revgalblogpals The Pastoral is Political. 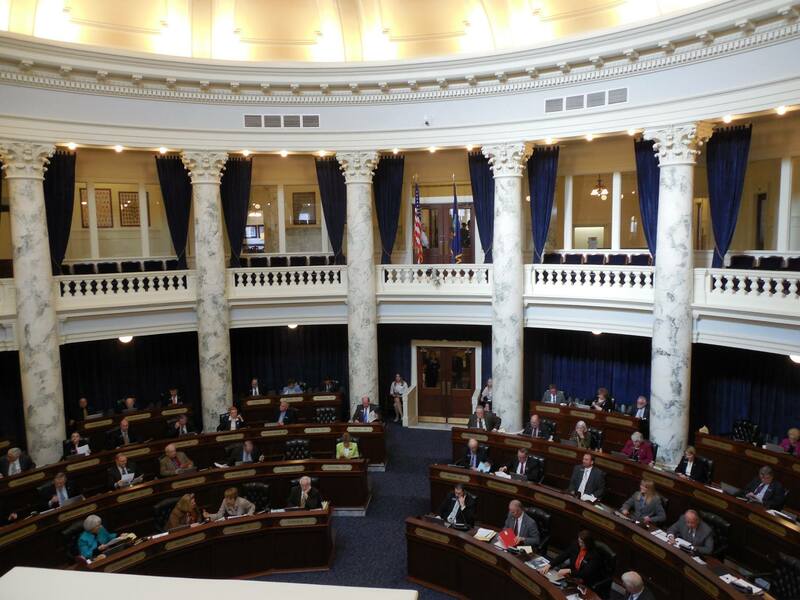 While the legislature has been in session in Idaho this winter, I’ve been more involved than I have been in the past. I’ve been frustrated by leadership in the Capitol who continue to refuse to allow Add the Words to have a hearing. Municipalities across Idaho have had to enact their own non-discrimination ordinances to protect their citizens because the leadership at the Capitol will not. I’d been involved with Add the Words before, but when Rep. Lynn Luker presented a bill about “religious freedom“, I knew I had to do more. I stood on the Capitol steps for 3 hours (while it snowed on us) in silent demonstration, as so many Idahoans have been silenced by the leadership of the House and Senate. 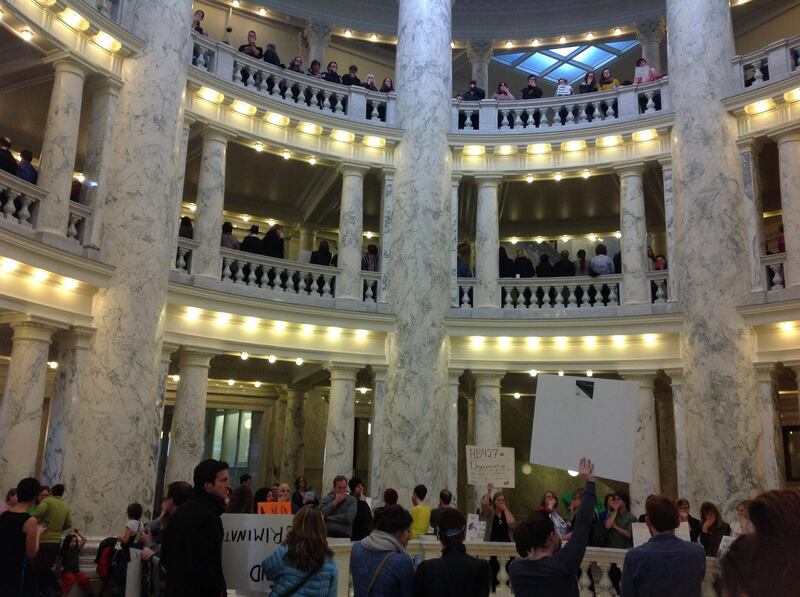 44 people chose to be arrested that day, blocking the entrance to the Senate chambers in silent protest. I joined with 600 Idahoans on Feb 17 to Pack the Capitol and make sure the leadership knew we really wanted them to address our concerns. What I’ve enjoyed the most, though, is sitting in the House Gallery with my clergy colleagues while the House is in session. 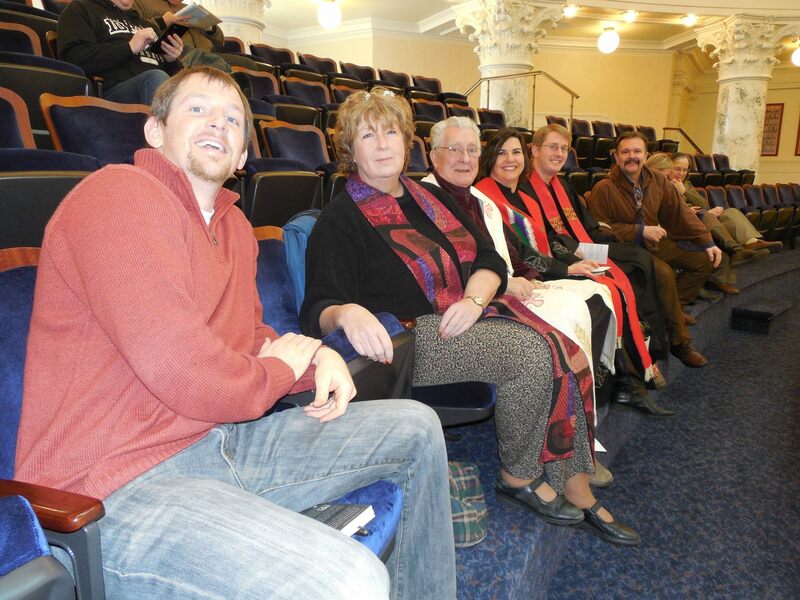 We wanted to be there, in our vestments, to make sure the House knew we were still paying attention, and we were still opposed to Rep. Luker’s bill. While he may have seen his bill as necessary to protect religious freedom, this group of religious leaders believe it codifies discrimination and is antithetical to the call of Jesus. All of this time I’ve spent at the Capitol these past few weeks has been seen by many people as “demonstrating” or “protesting”. And it has been that. But as I’ve stood on the steps, our out in the hall, or sat in the gallery, I’ve also been silently praying. I’ve prayed for the people who have walked past me, that their work would be fruitful and their vision clear. I’ve prayed for the transgender Idahoans, who struggle to find acceptance and face discrimination I can’t even imagine. In addition for their safety and shalom, I pray they may know how deeply they are loved and cared for by the God who created them in their unique perfection. I’ve prayed for the allies, who are there because either their faith or their conscience compels them to work for justice for other people. I’ve prayed for the police officers and security guards entrusted with our safety at the Capitol, for their wisdom and well being. 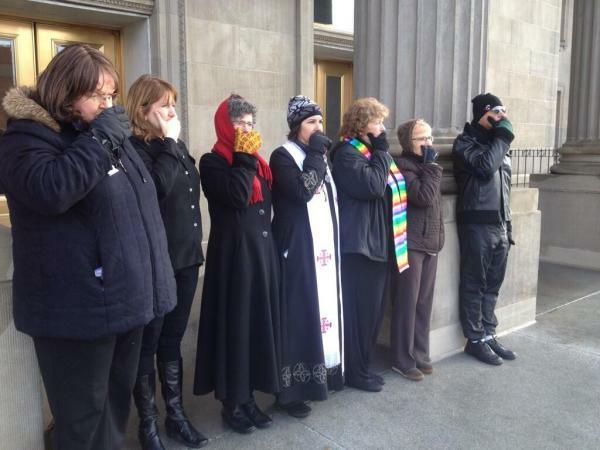 I’ve prayed for the gay and lesbian Idahoans, who have to hide their identity at work so they won’t lose their job, who live in fear that their sexual orientation will endanger them or the ones they love. I’ve prayed for their hope, courage, safety, and freedom to be themselves. I’ve prayed for each of the House and Senate members, for their health, wisdom, and discernment as they do their work in the legislature. I’ve prayed for their families who are holding down the fort at home while they serve in Boise. I’ve prayed for the shalom, the well being, of the people who live in each of their legislative districts. I don’t know how or if it changed any of them, but it changed me. At no point have I prayed for my opponents to be smited. I have not prayed for them to see the error of their ways, no matter how tempting that might be. I have not prayed for them to lose. Now, I don’t want to overstate things–none of the people I’ve been praying for these past few weeks at the Capitol are my enemies, no matter how we disagree on politics. I recognize they are there because they love Idaho and wish to serve. But I confess it is easy to see political opponents as “enemies”, as others. And when we do so, we forget we are connected. 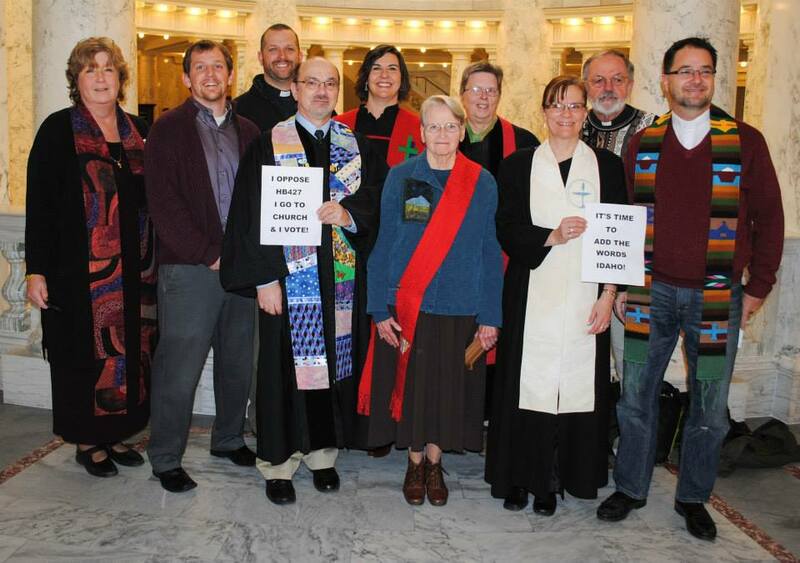 So praying for them, and for everyone else at the Capitol, has been good for me, reminding me the only way forward is if we secure the well being of everyone–BOTH the people who currently live in fear of violence and discrimination because of their sexual orientation or gender identity AND the people who fear that equality will somehow limit their ability to practice their faith. Next time you see me standing in the Capitol holding a sign, or at a big rally full of people, know I am also praying. And I will continue to pray, after the legislative session ends, that we may seek understanding and work for each other’s well being. February 21, 2014 in Add the Words, Pastoral is Political, Political Discourse, Reflection, social justice.